EISCO provided the procedures, manpower, pumping system, centrifuge system, hoses, pumps and pipe for a H2S neutralization, centrifuging and tank cleaning job in Paulsboro, NJ. The tank was a sour water tank, 60’diameter and 56’ in height. 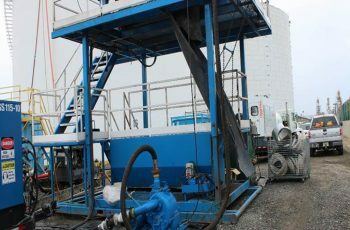 It had an 18” of sludge, 755 barrels of solids, a liquid volume of 31,710 gallons and an estimated 22 tons in-situ. EISCO began by chemically neutralizing the hydrogen sulfide and degassed the vapor space prior to venting the atmosphere through carbon beds. EISCO vacuum removed the sludge and contents of the tank for processing. We then proceeded to process the sour water sludge using a centrifuge to separate the solids from the liquid. EISCO loaded the waste solids resulting from sludge processing into waste disposal containers. EISCO finished by cleaning the tank until it was clean and gas free.